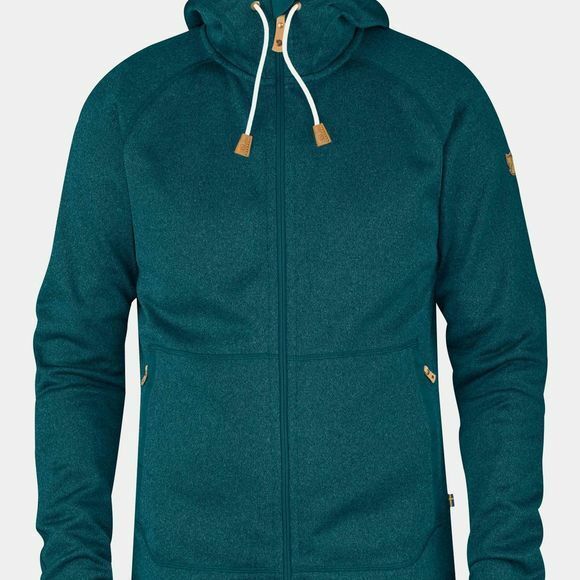 This Men's Fjallraven's Ovik Fleece Hoodie is warm and cosy fleece jacket with a knitted exterior and soft brushed interior. Very versatile, the Ovik fleece can be used as an insulating layer under a shell on cold autumn/winters day or as an out layer on milder days. Featuring a fixed hood with a drawcord adjustment and two spacious pockets with zippers, the Ovik is a hardwearing utilitarian garment. Elastic binding on sleeve cuffs.